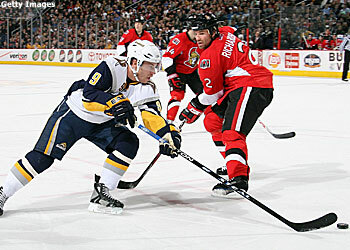 The Ottawa Senators face off against the Buffalo Sabres at 7pm. Following a two-day holiday break the NHL is back in full flight with nine games scheduled Wednesday night. Four 7 p.m. starts feature the Ottawa Senators facing off against the Buffalo Sabres, the Carolina Hurricanes taking on the New York Rangers, the Tampa Bay Lightning against the Washington Capitals and the Columbus Blue Jackets playing the Atlanta Thrashers. Later, the Toronto Maple Leafs face the New York Islanders, and the Minnesota Wild travel to Dallas to play the Stars. In a pair of Central Division matchups, the Nashville Predators play the Chicago Blackhawks and the St. Louis Blues play host to the Detroit Red Wings. * It doesn’t seem to matter which goalie plays in Ottawa, because the Senators have only failed to get a point once in their last nine games. Goalie Martin Gerber has four wins in his past five starts, and Ray Emery is 3-0-2 in his last five games. * The Sabres are riding a season-high six-game winning streak, which has seen them go from last place in the Northeast Division to within one point of second place. The Sabres now sit in sixth place in the Eastern Conference. * Carolina defenseman Bret Hedican has played 20 minutes in each of last four games and is a plus-3 during that span. * Rangers goalie Henrik Lundqvist only has one win in his last five games and has yielded 18 goals during that span. The Rangers have fallen from fighting for first place in the Atlantic Division with the New Jersey Devils to struggling to remain in playoff contention. * Tampa Bay forward Vincent Lecavalier has scored 47 points in 48 career games against Washington, including two goals and five assists for seven points in four contests this season. * Washington forward Michael Nylander is making up for a slow start to his season with points in six of his last seven games and has seven points during that span. But Nylander is on pace to score nine fewer points than he did last season playing with the Rangers. * Atlanta forward Mark Recchi is backing up his words that the Pittsburgh Penguins would regret waiving him. In his seven games with the Thrashers, Recchi has eight points. * Columbus defenseman Ron Hainsey has played 20 minutes in each of his last four games and his plus-5 rating is the second highest on the team. * Toronto forward Nik Antropov is having far and away the best season of his NHL career. Antropov, who has never scored more than 45 points in a season, has 35 points in 36 games. * Islanders goalie Rick DiPietro is among the busiest goalies in the League. Backup Wade Dubielewicz has only played 178 minutes in four games. * Nashville captain Jason Arnott is the Predators’ catalyst. He leads the team in goals (12), assists (17), points (29) and plus-minus (plus-7). * Chicago rookie sensation Patrick Kane has three assists in three games against the Predators, but is also a minus-3 in those games. * Blues defenseman Bryce Salvador leads the club with a plus-13 rating. Salvador’s rating is eight points higher than Erik Johnson’s and Jay McKee’s plus-5, who are next among St. Louis blueliners. * Minnesota forward Marian Gaborik has points in 12 of his last 13 games and has recorded 17 points during that span, highlighted by a six-point performance Thursday against the Rangers. * Dallas has the fourth-best power play in the League, connecting at a 22.4-percent clip. Stars captain Brenden Morrow leads the club with seven power-play goals. * Stars forward Mike Ribeiro has points in seven of his last eight contests and has 15 points in that span. Ribeiro had two goals and two assists Dec. 13 against the Kings. * Sharks star forward Joe Thornton has 34 points in 28 career games against the Pacific Division-rival Kings. * Only the Hurricanes’ penalty kill (76.3 percent) is worse than the Kings, who are killing off just 77.3 percent of their penalties. Los Angeles has given up four shorthanded goals in its last three games.